or white china bowls covered in blue tulips. And don't even mention Shabby Chic. LOL...wonder what one finds at a man sale? I think you might find dolls...the ones that blow up...lol! Funny! And yes, what WOULD one find at a man sale! Still giggling! Another fellow Unraveller here, stopping by to say hello! I hope you went to the Man Sale for us so we could all have a good laugh. 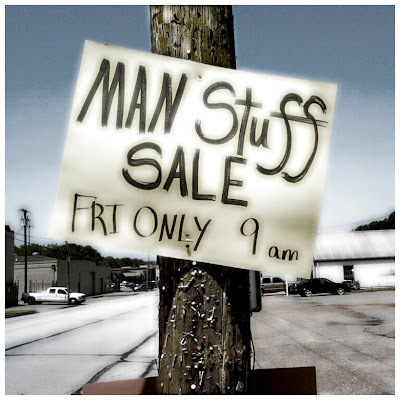 That should bring alot of men running, I see them at garage sales all the time and most of the time they are looking for things that aren't there, like tools, etc. Let me know if there is anything good! This is one perfect post. I don't even have the words to tell you. Just simply perfect.